DEMONSTRATE VALUE. Understanding the current economic pressures that may be having an impact on the ability of companies to send staff to conferences, the Biopolymer World Organisation has compiled a Justification Toolkit to assist you in presenting to your manager the many benefits of attending Biopolymer World Congress and why it is a worthy expense. Attendance at this conference will more than pay for itself via the improved knowledge and efficiency that you can bring back and apply in your everyday work. This Justification Toolkit includes the benefits of attending, justification tips, cost saving tips, calculating return on investment, and we’ve also put together a sample justification letter which you can modify to fit your needs and present to your manager. Attending the Biopolymer World Congress is the most cost-effective professional development opportunity you will have all year – we hope you will be able to join us! BENEFITS OF ATTENDING. • Attend presentations from industry professionals about cutting-edge innovations and the future direction of biobased chemicals and biopolymers research and development. • Learn how the production of renewable materials offers the potential to replace petroleum-derived, non-renewable materials, eventually resulting in reliable supply chains, sustainable production, lower greenhouse gas emissions, and competitive prices. • Discover how you can capitalize on the future market in biobased chemicals and biopolymers. • Identify innovative applications and understand how they can offer substantial business benefits. JUSTIFICATION TIPS. The fast-changing nature of new technologies and the development of new products from renewable raw materials, makes it necessary to update knowledge on a yearly basis in order to keep current. • Emphasize that the Biopolymer World Congress offers a comprehensive, time-intensive learning environment. Your attendance will be much more cost effective and time-efficient compared to registering and attending multiple meetings. Plus, you’ll minimize the time you are away from the office. • Biopolymer World Congress offers a world-class education that is unparalleled in the industry. The varied and vibrant conference format provides a wealth of learning opportunities. • Professional development training becomes critical to prepare employees to take on greater responsibility. Attending this conference will ensure your skills are up to par. • Take new knowledge back to the office by offering to prepare and deliver a short presentation and Q&A to your colleagues to share what you have learned. That way others in your team will get the benefits of your attendance, too. • Create comparisons of products or services you learned of in the exhibit hall and show how they will decrease expenses or improve efficiencies. • Determine the total cost to attend, study the programme, be prepared to explain what you expect to get out of the conference, and align your organization’s goals with the conference programme. Use the sample Justification Letter to send a formal request to your manger and then schedule a follow up meeting to discuss your request in person. • Propose the negative impact of not attending and how this could adversely affect your professional skills development. Just one cost-saving tip or efficiency learned at the Biopolymer World Congress when multiplied on a daily basis and amongst colleagues, could more than justify the cost of attending the conference. Calculating ROI (Return on Investment) Conference expenses are affected by a number of factors. 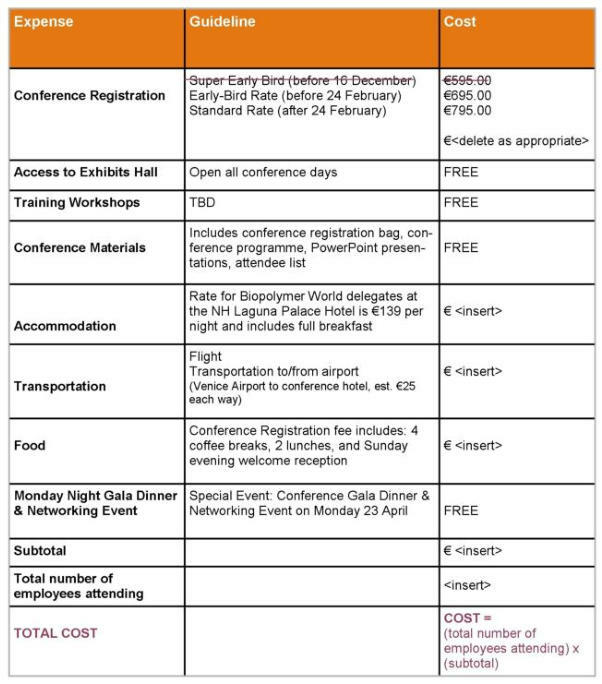 Use the following Expenses Worksheet to develop a cost estimate for attending the Biopolymer World Congress. Understanding the breakdown of the conference expenses will help you in justifying your attendance. Sample Justification Letter for Management Approval We are putting together a sample letter for you to present to your management, justifying the cost and explaining why you need to attend the Biopolymer World Congress. Please use the template to request management support for your attendance at the conference, and feel free to edit the template, once available, to your specific circumstances. The Most Cost-Effective Professional Development Opportunity You Will Have All Year!